This decorative standing jewellery organiser is a fun way to display your favourite pieces on your dressing table. With enough hooks and holes to store at least 10 pairs of stud earrings and many necklaces, rings and bangles. This typical South African product will look spectacular as a centrepiece on the dressing table. If you are looking for a decorative yet practical gift idea for an 18th or 21st birthday you have just found it! 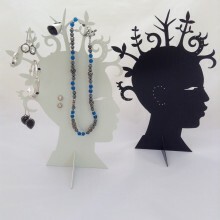 This jewellery organiser, part of our ‘African Mama’ range will be a quirky, unusual present for the jewellery lover, student or for yourself. Declutter your dressing table with this excellent storage solution which is a decorative element on it’s own. In a choice of white or black. Made from sturdy metal the ‘Mama Preshus’ Head will add contemporary style with a quirky South African twist and add a touch of South African glamour to .